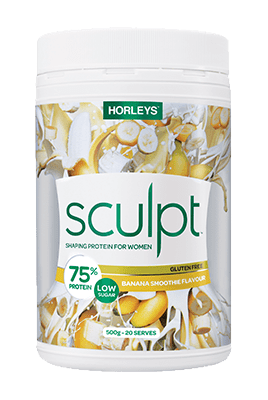 Horleys - Sculpt Protein Powder for Women. Weight Loss Shake or Meal Replacement. 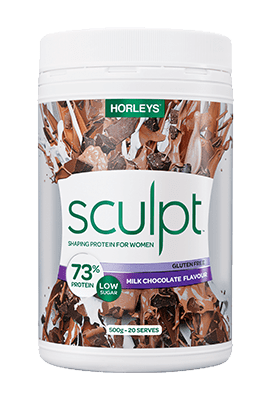 For dietary support: Sculpt makes a great morning or afternoon meal, or can replace lunch if required. If you're not good at eating breakfast, make yourself a Sculpt smoothie. To support exercise: Sculpt is ideal after a workout to replenish your body and help you recover more effectively. If you find yourself feeling hungry or fatigued during training sessions, try a serving two hours before exercise. 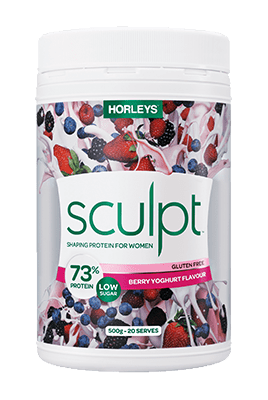 For weight management: Sculpt provides you with high protein meal and snack options to help manage appetite, assist (along with regular exercise) with muscle tone and fat loss, and to stave off unhealthy cravings. Sculpt is designed to fit into your eating plan, to give you options for eating small, frequent meals that have the power to boost your metabolism. If you’re actively managing your weight, Sculpt can be used as an occasional nutritious and convenient meal replacement* to assist with a calorie modified eating plan. 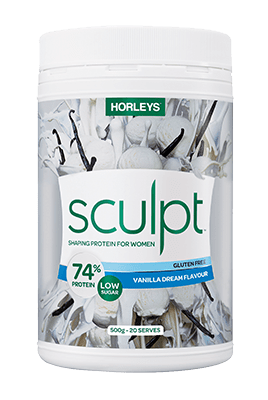 *While Sculpt is not formulated as a meal replacement specifically (like SlimShake), and is not a ‘diet shake’, it can be used for meal supplementation. 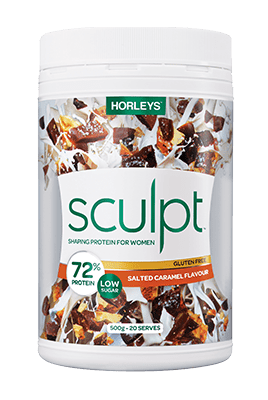 Sculpt is not to be used as a sole source of nutrition and has been designed to work best with a balanced nutrition plan including whole foods, and an exercise regime that includes resistance training and aerobic activity. Please note, if you are pregnant or breast feeding, Sculpt is not harmful but please call us for advice, or check with your health practitioner. Whey Protein Concentrate, Soy Protein Isolate, Soy Protein Concentrate, Cocoa, Thickeners (466, 415), Inulin, Super CitriMax® (Garcinia cambogia extract), Natural Flavour, Minerals & Vitamins (magnesium oxide, calcium carbonate, ferrous fumarate, ascorbic acid, dl-α-tocopherol acetate, beta-carotene, nicotinamide, zinc sulphate, cholecalciferol, vitamin A acetate, pyridoxine hydrochloride, thiamine hydrochloride, potassium iodide, riboflavin, folic acid), Aquamin® (calcium mineral complex), Carnipure™ L-Carnitine L-Tartrate, Anticaking Agent (551), Green Tea Extract, Sweeteners (955 – sucralose, 960 - steviol glycosides). Whey Protein Concentrate, Soy Protein Isolate, Soy Protein Concentrate, Thickeners (466, 415), Natural Flavours, Inulin, Super CitriMax® (Garcinia cambogia extract), Minerals & Vitamins (magnesium oxide, calcium carbonate, ferrous fumarate, ascorbic acid, dl-α-tocopherol acetate, beta-carotene, nicotinamide, zinc sulphate, cholecalciferol, vitamin A acetate, pyridoxine hydrochloride, thiamine hydrochloride, potassium iodide, riboflavin, folic acid), Aquamin®(calcium mineral complex), Carnipure™ L-Carnitine L-Tartrate, Anticaking Agent (551), Sweeteners (955 – sucralose, 960 - steviol glycosides), Green Tea Extract. Whey Protein Concentrate, Soy Protein Isolate, Soy Protein Concentrate, Natural Flavours, Thickeners (466, 415), Inulin (Chicory Root Extract), Garcinia Cambogia Extract, Minerals & Vitamins (magnesium oxide, calcium carbonate, ferrous fumarate, ascorbic acid, dl-α-tocopherol acetate, beta-carotene, nicotinamide, zinc sulphate, cholecalciferol, vitamin A acetate, pyridoxine hydrochloride, thiamine hydrochloride, potassium iodide, riboflavin, folic acid), Aquamin® (calcium mineral complex), Carnipure™ L-Carnitine L-Tartrate, Natural Colour (162- beetroot juice powder), Anticaking Agent (551), Green Tea Extract, Sweeteners (955 – sucralose, 960 - steviol glycosides). Whey Protein Concentrate, Soy Protein Isolate, Soy Protein Concentrate, Thickeners (466, 415), Inulin (Chicory Root Extract), Natural Flavours, Garcinia Cambogia Extract, Minerals and Vitamins (magnesium oxide, calcium carbonate, ferrous fumarate, ascorbic acid, dl-α-tocopherol acetate, beta-carotene, nicotinamide, zinc sulphate, cholecalciferol, vitamin A acetate, pyridoxine hydrochloride, thiamine hydrochloride, potassium iodide, riboflavin, folic acid), Aquamin® (calcium mineral complex), Carnipure™ L-Carnitine L-Tartrate, Anticaking Agent (551), Green Tea Extract, Natural Colour (beta-carotene), Sweeteners (955 – sucralose, 960 - steviol glycosides). Whey Protein Concentrate, Soy Protein Isolate, Soy Protein Concentrate, Natural Flavours, Thickeners (466, 415), Salt, Inulin (Chicory Root Extract), Garcinia Cambogia Extract, Minerals and Vitamins (magnesium oxide, calcium carbonate, ferrous fumarate, ascorbic acid, dl-α-tocopherol acetate, beta-carotene, nicotinamide, zinc sulphate, cholecalciferol, vitamin A acetate, pyridoxine hydrochloride, thiamine hydrochloride, potassium iodide, riboflavin, folic acid), Aquamin® (calcium mineral complex), Cocoa, Carnipure™ L-Carnitine L-Tartrate, Anticaking Agent (551), Green Tea Extract, Sweeteners (955 – sucralose, 960 - steviol glycosides). Halal certified except Banana Smoothie flavour. L-carnitine, the cellular shuttle that transports fat to where it can be used as a fuel source. We use Carnipure™ L-carnitine, which is more pure than other sources and highly bioavailable. Garcinia cambogia - a natural plant extract. It has been shown to suppress appetite and inhibit fat production. Sculpt uses Super Citrimax®, the most potent, highest quality Garcinia cambogia source available.